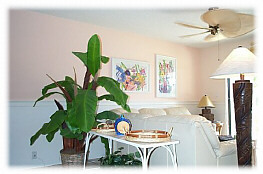 Juno Beach Direct Oceanfront Condo is only 12 steps to the ocean boardwalk from the patio. 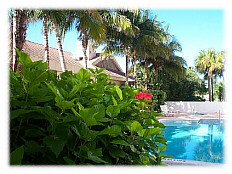 The property has lush landscaping and is very quaint, private and safe. The interior will remind you of being at a Key West style beach house. Very comfortable and relaxing. Open the patio doors and hear the ocean waves. The swimming pool is next to our condo. Juno Beach, Florida is a quaint, upscale, beach community on a barrier island on the Atlantic Ocean. Our condo is in a newly renovated 4 story building directly on the ocean. Jupiter is about 4 miles north and Palm Beach Gardens is a few miles south on highway A-1a. Very comfortable master bedroom has a king bed. Sliding patio doors face the ocean and open to the covered patio. The ocean boardwalk and deck is directly behind the patio. The master has a TV with cable. The 2nd bedroom has a new queen bed. Carpet in bedrooms. The master has a newly remodeled in 2003 marble and tile bathroom and shower. The 2nd bedroom has a new queen bed and next to a full bathroom with tub and shower. The kitchen is fully equipped. Refrigerator is fairly new and has an ice maker. Pots, pans, dishes and silverware is in place. The dining table comfortably seats six adults. The condo was recently painted and looks very nice. The floors are ceramic tile. 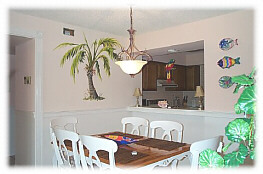 The family room and dining room are decorated like a beach house with moldings and soft tropical colors. Sliding doors from the Family Room and Master Bedroom open to a large patio. 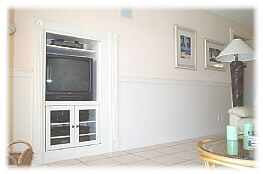 The family room has a built-in entertainment center with large TV, stereo, CD, Tape and VCR. The parking lot is private. You must have a gate code to walk in back to the beach. The police department is 1/2 block away and they patrol our complex. Crime in Juno beach is virtually non-existant. Walk out the patio door and you will see the ocean boardwalk which is 12 steps away. The beach is our back yard! The spacious patio has a private outside dining table. Pets not allowed per complex rules. The spring training camp for the St. Louis Cardinals and Montreal Expos is about 12 minutes away taking Donald Ross Blvd. west. Baseball players and fans usually rent our condo in February and March. Call for availability for 2004. Book the season early. To see a color brochure of our condo click here. The Juno Beach Fishing Pier is just a mile walk up the beach. Great fishing. February and March are monthly rentals only. Florida Tax and exit cleaning fee is additional. Long term leases are available.